For those homes having suffered greatly from all the storm water, getting the lawn back can take some time. Grasses have a very limited period to come back once under water, just a few days, and yards in many areas were covered a lot longer. 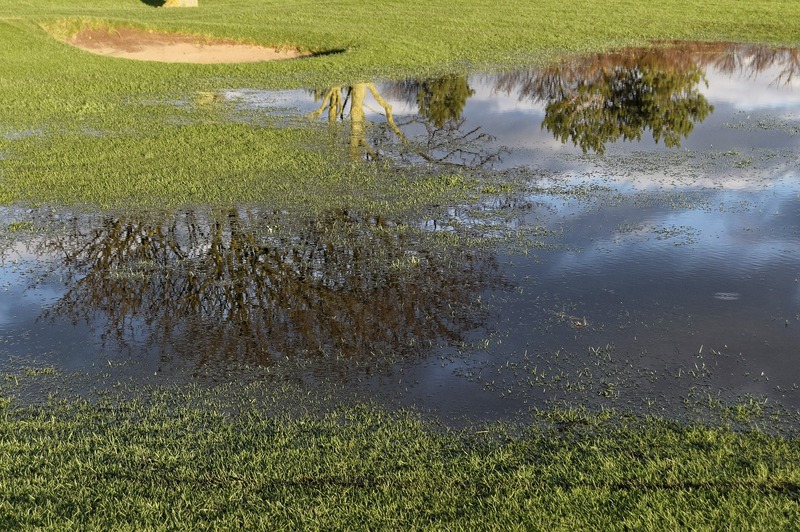 If the water came and went but left the lawn covered with silt and mud, rinse off the grass blades so the grass plant can begin to produce energy again. As the floodwater filled all the available pore spaces in the soil, it displaced any soil oxygen. Core aerate as soon as possible, and again next spring, will help return oxygen into the soil profile where most grass roots are found. All plants need that oxygen to actively absorb nutrition from the soil. 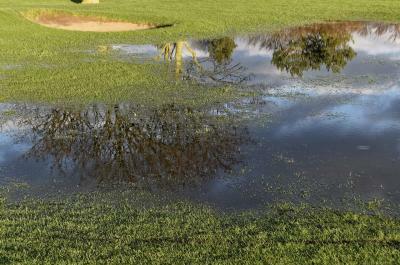 For those areas that stood in water for many days, the grass plants are not likely to recover and more recovery and repair will be needed. The core aeration will be key in reestablishing your lawn. We are approaching the fall seeding timeline for northern Illinois for our typical cool season grasses – August 15 through the first week in September. This period allows grass seed to germinate, grow, be mowed several times before winter dormancy, and be established to survive the winter. Options could be a traditional over-seeding or using a rental "slit seeder" that cuts through the dead grass and thatch layer placing the seed directly in the soil at the proper depth. If using a slit seeder, be sure to go in two directions to ensure a better stand of grass in the coming weeks. If you have large expanses of lawn, another method would be to hire a firm to "hydro seed" the area. Hydro seeding combines a straw-based spray with starter fertilizer, and the grass seed is sprayed over the damaged area. Using any of these methods will require you to keep the upper quarter inch of soil moist throughout the germination process. Grass seed is sold a couple of ways. Blends combine several grasses of the same species (i.e. all cultivars of Kentucky bluegrasses) or as a mix combining different species (i.e. Kentucky bluegrasses and perennial ryegrasses). Your choice depends on the quality of lawn you want to have or maintain. In older lawn settings, a mixture may be preferred since, over time, a single species lawn naturally becomes a mixed lawn. Perennial ryegrasses can germinate in as little as 3 to 4 days while bluegrasses can take 10 to 14 days. If the lawn has been growing in shade, consider fine fescues, which are much more shade tolerant than bluegrasses. Another expectation as the water recedes is all the kinds of seeds left behind that can and will show up. Some will germinate but not tolerate being mowed and naturally die yet this fall. There will be the opportunity for lots of weed seed germination to take place next spring and some of them will have the same fate, not tolerating being mowed. Annual weeds that germinate each spring are dead by frost so do not let them seed to prevent future problems. If perennial weeds establish themselves and survive being mowed, a weed control treatment may be needed to remove them from the lawn.